The Hochstein Music School, The Advocacy Center and Jimmie Highsmith, Jr. are hosting a one-hour music clinic for 70 teenage and young adult student musicians who are interested in learning more about jazz. The clinic will be held at Hochstein, 50 North Plymouth Avenue, on Saturday, May 5, 2007 from 4:00-5:00 pm. Jimmie will talk about the history of jazz and the difference between jazz and other types of music, after which there will be time for questions and answers, and then Jimmie and the students will end the clinic with a jam session. The event is open to student musicians, instrumental or vocal, age 14 and older. Students are encouraged to bring their instruments with them. If you or your child would like to participate, please contact Joyce Steel at The Advocacy Center at 546-1700 ext. 234 by Wednesday, May 2, 2007. This event is billed as a warm up for “A Night of Hot Jazz and Cool Art,” a benefit for the Advocacy Center on Saturday, May 12, 2007 from 8:00 to 10:00 pm at the Memorial Art Gallery and will feature the music of Wycliffe Gordon, Jimmie Highsmith, Jr., and Tyler Owens, as well as a silent auction and light refreshments. To purchase tickets for the May 12th event, contact Anna Costalas at the Advocacy Center at 546-1700 ext. 265. I found another great site for the jazz-inclined, JazzCorner.com, brought to you by Lois Gilbert. In addition to being the "largest portal for the official websites of more than 180 jazz musicians and organizations", the site includes a number of other resources, including video sharing where you can upload and share jazz and blues videos, a jazz jukebox, and the JazzCorner Speakeasy, the busiest bulletin board for jazz. I found that there is a thread for Upstate NY. I'm going to try to be on there more often to find out more about what's going on in Central and Western NY. There is also a great podcast series called Innerviews (which I've added to my podcasting links), with interviews of established and new to the scene jazz artists. Here are listings for the coming seven days. Artists and groups, please feel free to let me know if one of your gigs isn’t on here and I’ll try to add it to the post. Vince Ercolamento Quartet @ Friday Jazz at Immanuel Series, Immanual Baptist Church , 815 Park Ave., 7:00pm. Nada, zilch, zippo . . . .? On Thursday, April 19th, Lincoln Center Jazz Orchestra and Wynton Marsalis Septet saxman Victor Goines brought his quartet to the Exodus to Jazz series at VENU Resto-Lounge & Niteclub and they really heated up the place. Dianna and I made the late show with some friends. Goines and crew, which included fellow LCJO member Dan Nimmer (piano), Matt Rybicki (bass) and Ulysses Owens (drums), really tore it up. 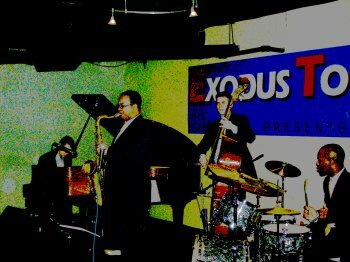 All but Nimmer were former students of Goines at Julliard, where he is head of jazz studies, and their performances clearly showed that Mr. Goines has some skills in the teaching area, especially Owens. Nimmer's piano at times sounded orchestral and he in places would go to almost a whisper before announcing a swinging climax with a pounding chord. Jose DaCosta, the man behind the Exodus to Jazz series is serious about the music. Where other music promoters might be working the crowd and making sure of the details, DaCosta was with the rest of us, lost in the swinging groove that Goines and his crew were digging. He didn't have to enforce his "whisper-only" policy as everyone in the house was listening, interrupted only by drink orders and exclamations when a solo became particularly exciting or the emotions brought up by the music became a bit too much to bear (my wife was especially vocal in her approval). This series is consistently one of the best things going in Rochester, jazz-wise, and I recommend that you check it out. DaCosta brings in top-notch artists and the venue is well suited for what his series is all about—enjoying jazz and those who make it. Get out there and hear some live jazz . . .
Artists should send me any additional gigs that are not listed here and I'll try to add them to this post throughout the week. Support local jazz radio and get aload of this space, while sipping wine and eating crudites, and buying art: Art Loves Jazz at Artisan Works. Our local 24/7 jazz radio, WGMC Jazz90.1 has announced the date of its fundraising party at Artisan Works—Art Loves Jazz. It was a great time last year. This year's shindig will be held on Thursday, May 17, from 7-10 P.M., will combines art and jazz, including local jazz artists (including Bob Sneider, Mike Melito and DubbleStuff) to benefit Jazz90.1. This event will feature live art and silent auctions, gourmet food and live jazz throughout out the 60,000 SF gallery, which is really a sight to behold in case you haven't checked it out before. Tickets are $30.00, and can be purchased by calling (585) 966-2660. Only a limited amount of tickets will be sold, so if you want to go, better give them a call ASAP (Dianna and I plan to). Artisan Works is located at 565 Blossom Road. Hey . . . isn't that you bobbing your head over at the 2006 Rochester International Jazz Festival!! We're on TV! In case you haven't heard, last year WXXI taped a number of performances at the Rochester International Jazz Festival in High Definition and will be presenting the six part series to premiere May 27 at 7 p.m. with an hour-long program on WXXI-TV and WXXI-HD. The series will continue on June 7th, the day before the 2007 RIJF at 8 p.m., where five Festival concerts will broadcast in a special evening. The program includes five half hour performance programs featuring Karrin Allyson, Mose Allison, Cedar Walton, The Charlie Hunter Trio and the Preservation Hall Jazz Band. Each half hour program was recorded at the Eastman School of Music’s Kilbourn Hall in Rochester, New York. The first one hour special program was recorded over the full nine days of festival in June 2006, which should be a great overview of the 5th Annual Rochester International Jazz Festival. With nearly 600 artists and more than 200 concerts in multiple venues, the upstate city of Rochester, New York is a world jazz capital. The series will also air on over 75 PBS station across the country, with more to follow, spreading the sights and sounds of Rochester a little further than the airwaves carry WXXI. Some listings for you for this weekend. Jazz trombonist Wycliffe Gordon, a member of the Lincoln Center Jazz Orchestra and Wynton Marsalis's other groups, is joining local favorite saxman Jimmie Highsmith Jr. and vocalist Tyler Owens at the Memorial Art Gallery on Saturday, May 12, 2007 from 8 pm to 10 pm at "A Night of Hot Jazz and Cool Art," a benefit for The Advocacy Center. The Advocacy Center provides information, support and advocacy to individuals with disabilities and their families. Jimmie Highsmith will also be celebrating the release of his third CD, "It Is What It Is," which features Wycliffe on several tracks (tracks I had the opportunity to see being recorded). The benefit will also include an art auction, with proceeds benefiting The Advocacy Center's programs. Lia Lando from Fox Rochester and News 8 Now will serve as Host for the event. Hors d'oeuvres and desserts will be provided by local restaurants and bakeries. Sponsors include Wachovia, Faraci Lange LLP, Preferred Care, and WROC Channel 8. Advance tickets for "A Night of Hot Jazz and Cool Art" are $35 person and can be purchased by calling The Advocacy Center at 546-1700. Tickets will be $40 at the door. One of the standout things about my friend Jimmie Highsmith Jr. is how he tries to give back to the community through his music. This is his second year playing for The Advocacy Center's event (and my second year trying to help them connect with you), and he is happy to be involved again: "I wanted to some way benefit a cause that I really felt strongly about," said Highsmith. "I've seen the struggles individuals with disabilities and their families go through to create quality lives. There are a lot of children, adults, and families who need help to break down the barriers that keep them from realizing their goals." Go get'em Jimmie. There is some interesting bio material here. Hope to see more as we get closer. I think there will be based on the tag line. Keep checking it out (you can click on it now to take you there). I will be, too. Fred Stone & Company @ Little Theatre Cafe, 8:00 pm (Fred Stone is there every Saturday in April). Pierre Dorge & The New Jungle Orchestra @ German House Theatre, 8:00 pm (see the writeup on the Upcoming Events page at The Bop Shop site and Ron Netsky's article in City Newspaper. It's On . . . Rochester International Jazz Festival artist lineup goes live! A few minutes ago, the artist lineup for the 2007 Rochester International Jazz Festival went live on the RIJF site. June 8-16 looks like another RIJF full of mixing up a wonderful stew of new and tried and true names. There are two new venues: Harro East Ballroom, which provides some additional large space; and the Reformation Lutheran Church, which will be used to present a series of Nordic jazz artists. There is a new outdoor stage sponsored by the City at East and Alexander. Montage and the former Milestones, now High Fidelity, return as venues (although only High Fidelity has hosted any jazz since last year's RIJF). Local artists who will be appearing during the festival, include: Dave Rivello Ensemble, Gap Mangione Quintet, Mambo Kings, Smugtown Stompers, Urban Transit, Rochester Metro Jazz Orchestra, Paradigm Shift & Special Guests Gray Mayfield, Marcus Printup & Wycliffe Gordon, assorted high school and Eastman bands and groups, and of course the Bob Sneider Trio holding court at the State Street Bar & Grill. There is much to explore on the RIJF site and I suggest you go there to start mapping out YOUR festival. If you don't have your pass yet, you better get one soon as they are likely to sell out. I've heard that the festival is expecting up to 120,000 folks this year—a big leap in attendance. I've added a lot of the names to the Technorati tags below. Click on the links and you may find more information about them through that site from other blogs. Apparently, April is Jazz Appreciation Month—who woulda thunk it? Well, the Smithsonian Institution's National Museum of American History did and recently contacted me as a community jazz advocate to do what I can to promote their new cultural initiative "intended to draw public attention to the glories of jazz as both an historical and a living treasure." The idea is to encourage musicians, concert halls, schools, colleges, museums, libraries, and public broadcasters to offer special programs on jazz every April. This is the sixth annual Jazz Appreciation Month, although it's the first I've heard of it. While they contacted me (and hopefully others in the community who are advocates of jazz...say WGMC?) a bit late to affect events for this year, perhaps this would be an opportunity those of us who want to broaden the opportunities to hear jazz in Rochester to bring the music we love to more. It would also dovetail nicely with the announcement of the lineup for the Rochester International Jazz Festival, which is in April. [Note to other jazz advocates in Rochester: If you didn't receive the Smithsonian's email, send one to me and I'll forward it to you.] Anyone out there want to start working on this should contact me by the email link this site and I'll start putting you together. Smithsonian Jazz has a Jazz Appreciation Month site with more information about the initiative, a jazz discussion board, and other goodies. Check out the PDF availalbe here of ideas of how to celebrate Jazz Appreciation Month. Go check it out and let's start planning for next year! I encourage you to leave a comment with your ideas.